I can't pass up a tube cigar and finally I grabbed this Romeo Toro En Tubo by Romeo y Julieta Cigars from Cigar Train about a month ago. After sliding it from the tube, I was surprised by how nice this 6 x 54 Toro cigar looked. The dark, oily Colorado Claro colored Ecuadorian Habano wrapper looks stout and delicious. It's rolled on with near seamless skill, it has only fine veins and it leaves behind a sweet aftertaste on my lips. The cold foot has an aroma of sweet fermented tobacco, while the free cold draw has nuances of oak and honey. Once the foot was on fire and burning the first medium/full bodied flavors were a mix of black pepper, leather, peat and sweet tea. In the second half the body moved into the full range with new flavors of caramel, molasses, espresso and cocoa. The Romeo finished it's ninety minute burn with flavors of dark chocolate mixed with charcoal. 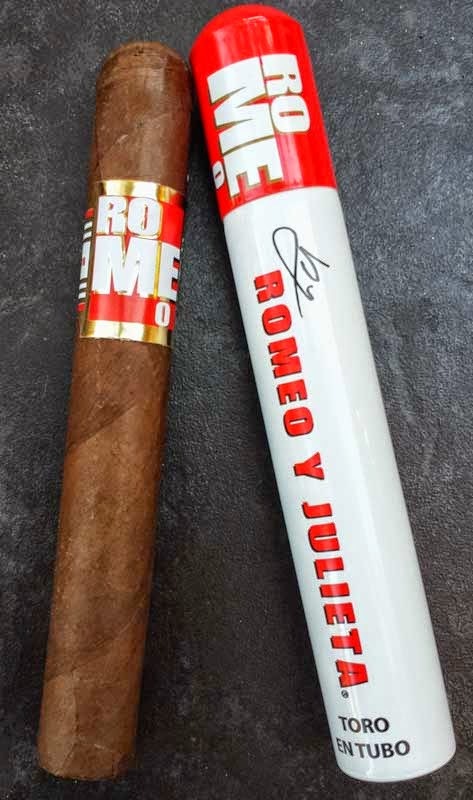 Although the flavor mix of the Romeo wasn't ultra complex, the flavors were solid and tasty. The cigar produced a large volume of smoke and it developed a deep, dark, oily sheen on the wrapper in the second half. Other than correcting the burn one time right in the middle this cigar was a fantastic smoking experience.